The radical thinkers of the 18th century offered tantalising visions of a more just society. Their ideas greatly influenced the French and American revolutions, which produced two of the world’s great republican democracies. In Britain, the loss of the American colonies was largely accepted with a sense of detached interest, and many reform-minded Britons initially related to and sympathised with the aspirations of the French Revolution. But feelings changed when the Terror began across the Channel and Britain found itself again at war with France. There was real fear of the mob among the ruling classes, as well as of the old bogey-man of Jacobitism. In 1793, Prime Minister William Pitt suspended Habeas Corpus (the right of a person detained by the authorities to have the legality of that detention examined by a court of law) and in 1795 introduced the so-called ‘gagging acts’ (the Seditious Meetings and the Treason Acts), which restricted public gatherings. Protests were as much a feature of Britain two or three hundred years ago as they are now, albeit back then they were more spontaneous, and often violent. 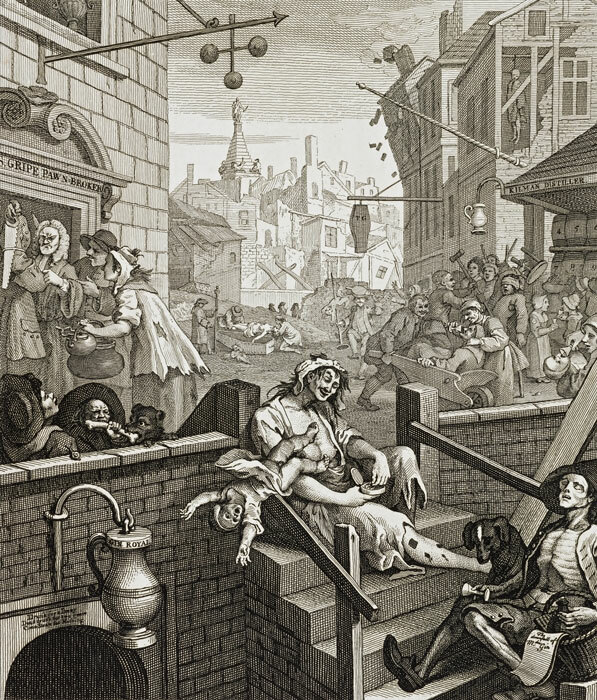 In 1743, there were riots after repeated government attempts to restrict the sale of gin – gin consumption was an extremely serious health risk at the time. Riots broke out amongst the weaving industry in London’s Spitalfields: in 1769, soldiers sent to arrest suspected rioters killed two and four were later executed. In Birmingham in 1791, a crowd attacked religious dissenters. The same year, in the small town of Tranent, near Edinburgh, 12 people were killed when soldiers were dispatched to put down a protest against being press-ganged to join the British Army. Back in London, in 1809, there were even riots sparked by an increase in the price of theatre tickets. But fear of the mob was also based on bitter experience. In 1780, an enormous crowd led by Lord George Gordon marched on the House of Commons to protest against modest measures of Catholic emancipation. The crowd turned into a pack, estimated to be about 60,000 strong, that rampaged through London setting fire to properties belonging to Catholics. The so-called Gordon Rioters went on to attack the Bank of England and various prisons, releasing the inmates of Newgate. Troops were sent in and 200 people died. The Corn Laws, introduced in 1815, imposed a tax on imported wheat to protect domestic production, but forced the price of bread so high that many could not afford to buy it. People were hungry. Discontent was growing – exacerbated by frustration that, because so few were allowed to vote, Parliament only represented the views of the wealthy self-interested elite. Some 60,000 people attended a peaceful demonstration held in 1819 at St Peter’s Fields in Manchester. The main speaker was Henry Hunt, a leading political reformer. The crowd gathered to hear Hunt speak about reform. However, alarmed magistrates called in local troops to arrest Hunt and clear the area, which they did by riding into the crowd with sabres drawn. 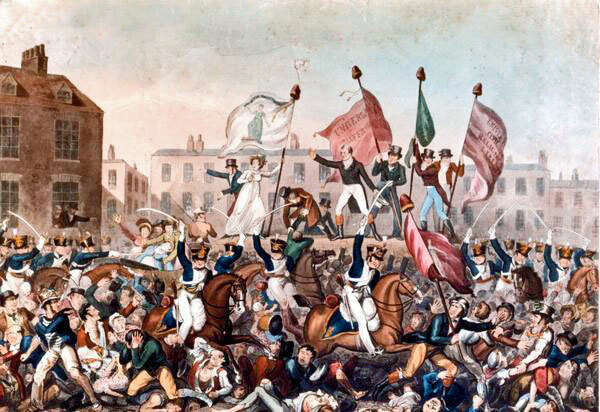 At least 11 demonstrators were killed and some 500 were wounded; the event became known as the Peterloo Massacre, ironically comparing the event at St Peter’s with the carnage of the national victory at Waterloo four years earlier. In response, Parliament astonishingly passed ‘the Six Acts’ which, amongst other things, prevented writings and gatherings considered to be ‘seditious’ or ‘treasonable’. The government later claimed an incident known as the Cato Street Conspiracy, a failed attempt to assassinate the cabinet, justified the Six Acts – though it seems that the Cato Street Conspiracy was at least partially encouraged by an undercover government agent. Five of its leaders were publicly hanged, and then posthumously beheaded; five others were transported for life. Yet – there was no sudden, violent, political revolution in Britain. The country certainly faced inevitable social revolution, but the shift in the balance of power was a very gradual process. In 1829, Home Secretary Sir Robert Peel introduced the first regular civilian police force in London – excluding the independent and wealthy City of London. Its officers became known as ‘peelers’, or ‘bobbies’ and they replaced an inadequate system of parish constables and watchmen, augmented by ‘Bow Street Runners’, an early attempt at policing pioneered by the author Henry Fielding. The new Metropolitan Police was a single force that could maintain public order in a consistent manner based on centrally determined policy, and without the need to call upon troops who were liable to use lethal weapons. ‘Peelers’ were equipped merely with truncheons, handcuffs and a wooden rattle – and their uniform was intentionally un-military. Centrally funded policing was gradually extended across the rest of Britain, becoming a requirement in 1856.